Debates about the Affordable Care Act will continue -- in the Supreme Court, in the halls of Congress and around the country -- but health reform is already happening all around us. All we need to do is look. A case in point is Cheboygan on the shores of Lake Huron, where the local hospital was closed suddenly at the beginning of April, and then resurrected -- in a different form -- in mid-May. The impression left in the community was that the federal government was unreasonably blocking the sale by requiring new certifications, but later reports shed more light on the government’s position, which turned out to be more nuanced than originally reported. By mid-May, a deal went through to restore emergency room and outpatient services at Cheboygan Memorial (and the rehiring of 150 staff) -- but the inpatient beds were to remain closed. Classic good news/bad news? Not so fast. The compelling question that was lost in the story is this: Should we really mourn the closure of those inpatient beds? After all, Cheboygan Memorial was a small hospital, in bankruptcy, with fewer than 50 acute care beds. People living in rural areas with small hospitals would say yes, citing critical access needs and reminding us that hospitals are often a community’s major employer. But while the strong community identity of these hospitals is completely understandable, the questions we need to ask and answer are: Do they deliver the best care? Is that care cost-effective? Would traveling farther put people at risk? In fact, there is considerable research to make us question the assumption that keeping small hospitals open is always a good idea, especially running as they have historically: as independent, community-based organizations. Practice does matter. When it comes to certain health-care services, doing more of something is associated with better, safer outcomes for patients. Small hospitals don’t have the volume necessary for staff to practice the full range of service needs that larger hospitals do. And if we are ever going to get a handle on the cost of care, economies of scale and efficiencies will certainly be part of the solution. 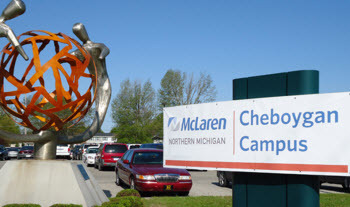 In the end, it was not only inevitable, but probably a good thing that Cheboygan Memorial Hospital closed and reopened -- with scaled back services -- as part of the much larger McLaren Health System. Emergency and basic care will remain in the community; inpatient care will likely mostly be delivered at McLaren Northern Michigan Hospital, 30 miles away. Some are still unhappy: after all, Cheboygan Memorial was a major employer. But this is health-care reform on the ground, and it ain’t all bad. I don't understand why maintaining community employment is seen as justification for keeping an inefficient and less effective facility open. Since when is a hospital a "jobs program?" As long as basic primary care and emergency services (with transport via helicopter if needed) are available, a 30 mile drive for hospital services is more than reasonable.